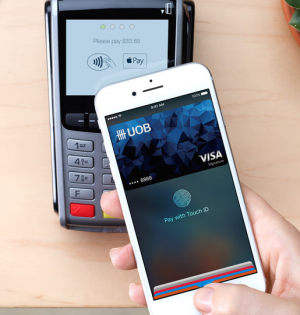 Visa Blocks Singaporean Bank UOB from Using Own TSP to Tokenize Visa Cards for Apple Pay | NFC Times – Near Field Communication and all contactless technology. Visa is not allowing one of Singapore's major banks, UOB, to tokenize its Visa-branded cards using its own token service provider. Visa is balking at allowing the bank to tokenization its Visa-branded cards for Apple Pay. UPDATE: But UOB, one of Singapore’s largest banks and card issuers, had already begun to work with a vendor to set up its own token service provider. That bank-owned TSP is operational now. But NFC Times has learned that Visa is blocking the bank from using it to tokenize its Visa-branded cards for Apple Pay, which launched in Singapore last spring. Visa cards make up around 70% of UOB’s more than 2 million cards on issue. Instead, Visa is insisting that the bank use Visa Token Service for its cards for Apple Pay, sources said. The bank, in a short statement, told NFC Times it is able to use its own token service provider to tokenize Visa-branded cards for its UOB Mighty app, but it would not comment on whether Visa is allowing it to tokenize Visa-branded cards the bank makes available for Apple Pay. END UPDATE. UOB is believed to have already paid for the tokenization platform it bought from the third-party vendor. Article has about 2300 words.